Since the beginnings of American anthropology in the 19th century, field ethnographers and ethnologists have remained silent with regards to American Indian medicine powers. To date, there has not been one book written by a professional anthropologist that addresses this subject. That is about to change. William S. Lyon received his Ph.D. in anthropology in 1970. He has spent the last four decades doing field research with many different American Indian medicine men, with an emphasis on the Lakota culture. In Spirit Talkers: North American Indian Medicine Powers, he ignores the long-standing academic assumption to view medicine powers as simply the superstitious beliefs of primitive people. Not only has he personally witnessed such powers and come to believe in their efficacy, he provides the long-missing ingredient to our acceptance of them–namely, an explanation of how they work. Armed with an undergraduate degree in mathematics and an ability to understand the findings of modern physics, Lyon gleans from the latest findings in quantum mechanics the basic rules that shamans follow to become successful at what they do. In addition, he includes many historical accounts of their proven abilities that support his findings that real shamans can do what they say they can do. For the first time ever you will read of the great extent and variation in the medicine powers that were used by the American Indians to achieve success in their daily activities. Virtually no aspect of their lives went untouched by the use of such powers, be it for warfare, hunting, crop growing, material success or healing. In fact, the acquisition of “good luck” in any venture of life was a primary concern to them, and for this reason they readily resorted to the use of medicine powers. This book will not only forever alter your perception of American Indians, it will also alter your concept of the potential of any human being. It is a long overdue tribute to traditional Native medicine people that is designed to unlock them from our past prejudices. William Lyon’s book, Spirit Talkers, is available in ebook, pdf and paperback editiions, and can be purchased here. Bill, thank you for this book. It is a wonderful example of scholarship and research. For me, though, its huge value lies in how it brings together shamanism, the quantum field, medicine powers and healing. You write simply, clearly and very engagingly. As I move into teaching the Greater Reality, I’m glad to have read your book so I can recommend it. What a gift it is! For many years I struggled with keeping my Lakota Spirituality, practice of Shamanism, and appreciation for quantum mechanics separated. As if they were water and oils. Your book has allowed me to see I do not have to do this and that all three are just slightly different ways of expressing the same thing. I have bought and gifted copies and recommended the book to anyone walking this path. I very much appreciate where my life is now Bill and part of that satisfaction is due to your book. You are both perceptive and courageous. Very few people have grasped the concept that we create the world around us with our own thoughts, and even fewer would risk their academic reputations or public image by openly discussing the subject with any degree of seriousness. I commend you on a well written and highly accurate depiction of how we do what we do. I recently published two books on my own training as a bear doctor in northern California when I began to fear the would be no more after me which related many of the same concepts. Thank you for believing in something the world seems determined to see fade out of existence. I want to thank Dr. Lyon for his book that provides a thorough documentation of various shamanic practices and the shaman’s ability to wield medicine powers. The book provides an insightful and straightforward account of the large variety of forms that medicine powers have taken throughout history. This in itself is an important historical documentation. Furthermore, Lyon places this documentation into a contemporary scientific perspective. He shows that current quantum mechanics theory allows for the possibility of shamanic powers. Lyon then uses these findings to give new understanding to the practices shamans have been using in North America. By referring to recent scientific research findings and theories, and alining them to shamanic practices, he demonstrates the reality of shamanic knowledge that has survived for millenniums, and continues to exist among the Native American population and shamans worldwide today. Since institutions have the power to exterminate, and furthermore have almost managed to destroy, ruin or discriminate the old Native American way of life and mindset, it is important to give both academia and the public access to this book. Lyon gives us an insightful summary and detailed description of the resistance he has encountered with academic institutions where prejudices about shamanism still stand strong. The book also gives a clear and interesting example of this in the appendix, written by Timothy White—a critique of A.B. Kehoe’s “Shaman and Religion” book. Threats to the protection of cultural heritage are continuously changing. This book is an important contribution that provides information on how to create new narratives and new talks between postcolonial government institutions and traditional Indian descendants. It is not often that a book can completely change the way we see the World. Spirit Talkers helped me understand what is possible – that what we perceive as ‘reality’ may not be ‘fixed,’ but can indeed be altered. What an incredibly valuable insight for those of us who have been told we have an incurable mystery illness. The documented, amazing accounts in Spirit Talkers gave me the courage and information to look beyond my traditional scientific training and understanding to a realm where many things are possible – including healing from any problem. So, thank you, again, Dr. Lyon for this valuable, fascinating book. Hi again Bill. What a great read! I was almost sorry to finish it. It opened up so many directions of thought. Using your references has led me to many more books to read. It’s hard to admit how narrow minded I have been concerning our American Indians. Thank you! I wholeheartedly recommend Spirit Talkers. Dr. Lyon’s book represents a lifetime’s work and is of the finest achievements in the field of traditional American Indian sacred ways. If true study is an art as much as a science, a complex interplay between subject and observer, few subjects present a more demanding challenge than human consciousness – especially in shamanism. Dr. Lyon has immersed himself in the field with rational analysis and direct participation for over forty years. His multidisciplinary research – anthropology, history, contemporary discoveries in quantum mechanics – is extensive, well-cited, lucid and appropriate. His firsthand knowledge is irreplaceable: not confined to academic circles, he has personally and respectfully experienced many ceremonies, and has had far-ranging discussions and long-term friendships with some of the greatest American Indian shamans and medicine men of the twentieth century. To understand realities that are not commonly understood in our culture Dr. Lyon has rightly used all of the human ways of knowing. He has documented events, principles, phenomena, dialogues, participants, outcomes and the reality of Indian medicine powers with clarity, humility and immense depth. The book is breathtaking, an unparalleled privilege to read, and offers many riches to consider for a long time to come. Thank you so much Bill for this most wonderful book!!! Talking about vector vortex collapse! There are very few works on Native American spirituality written by individuals who cut their teeth in the field, working with traditional shamans in their indigenous settings. Bill Lyon has apprenticed and trained with the finest medicine people on their own turf, giving his voice an authority few can claim. I am so happy to see this book finally in print, and the wisdom within that will offer us a vision into the inner workings of Spirit. Thank you for the production of this book. This has opened up my eyes to a way of life and a spirituality that was all so alien and incomplete to me. Living in a mostly Christian and mechanical world has covered my eyes and dampened my views of who I am and where I come from as a First Nations person. I have learned of the meaning and validity of medicine power and why we would use it when needed. I now see why Shamans and medicine people were so revered in our culture. I now understand what it means to use my heart instead of my head when determining that which is real and what is possible. I feel that I am too entrenched with this society’s way of thinking and have some deep inner journey I have to take on my own. There have been events in my life and feelings I have felt that go past my understanding, which your book has been able to fill gaps and explain what could be happening. Many of our reserves have lost the connection you speak of. The people do not believe in the spirit anymore, but I now see that we have to talk about this, we have to start telling the people. If I am ever so lucky to meet a Shaman or person of great medicine power, I shall believe and observe what I have been shown from your book. Thank you for giving me the tools to take back my cultural beliefs. I hope to some day pass this on so that the connection of the people and the spirit world is strong again. Bill, there are so many thoughtful and wonderful reviews here that it seems everyone has already said what I might have said … if I’d thought of it. For me personally, there was one word that came to mind when I read your book and that word is JOY. Why Joy? Because there is no joy like reading an extremely well-written and well-organized book that pulls you in and won’t let you go! I could say that the content pulled me in too, but content doesn’t come alive for me unless it is partnered with a skilled story-teller! Luckily for your readers, you gave us both great writing and great content, and Frank Lipp, has already talked about this beautifully. Thanks for writing this book and sharing it with the world. What a fun day it will be when more people begin to explore their own non-ordinary states of reality. An important book combining American Indian medicine beliefs with quantum physics theory. The author is experienced and has spent a great deal of time with various Native American tribes. This book opens up new avenues that future scholars will hopefully explore. Definitely worth the read! As a passionate elegy to Indian religion and way of life, this beautifully written book is, at once, superb, astonishing and overwhelming. Based upon decades of first-hand fieldwork and extensive historical and ethnographic literature, the author ranges boldly through North America to present an explanatory interpretation of the medical/spiritual powers of native Indians. Yet, the author goes far beyond this to explore and touch upon a wealth of topics that no review could do justice to. Unconventional in form, this daunting scholarly apparatus consists of 402 pages of text, 1,225 citations, with a 75-page bibliography. Far reaching in the subjects it treats, reading Spirit Talkers is like wandering through the stacks of a very fine library, browsing in the sections devoted to medicine powers, shamans, divination, healing ceremonies, vision quests, quantum mechanics, consciousness, intentionality, dreams, breath training, sorcerers, spirit helpers, alien abductions, and many more. The main focus to the book is the possible effect that ritual action has on material reality. Utilizing trance-induction techniques Indian shamans tap into the quantum level of reality with their consciousness. Verifying the Kantian notion that perception is reality, subatomic physics has shown that material reality is shaped in fundamental ways by the structure of consciousness, This has radical implications, one of which being that “mind” and “matter” are aspects of a single system. The author utilizes quantum reality to elucidate an explanation for the efficacy of Indian medicine powers. Quantum mechanics aside, reading this book will fundamentally change your understanding of North American Indians and their medicine powers. Frank J. Lipp, anthropologist with specialization in Mesoamerian ethnography and ethnobotany, and expertise in Mixe shamanism. In Spirit Talkers an anthropologist Doctor William Lyon provides an unusual “marriage”—quantum physics and Native American medicine powers. Lyon gives us a simple to understand version of the world view shattering implications of quantum mechanics—the indisputable and unfathomable implications that consciousness has for understanding of the material world. The confirmation of classic quantum mechanics’ notions that our consciousness can intervene in the material world allows us to move from disbelief to belief when encountering the extraordinary claims of medicine men and shamans. Lyon then draws on his many years of experience with Native Americans to evaluate many of the incredible accounts in terms of the possibilities offered by quantum mechanics, which gives us reason to assume that many of these events should be taken as real. Lyon’s conclusions take us into explorations of the nature of human evolution. But along the way he shows us that evolution was not just about our heads, but also about our hearts, the default mode of human functioning that gives us more powerful forms of knowing and power to our beliefs. Never again should we treat accounts of Native American shamans and healing as “just so” stories for entertainment. I obtained a copy of Spirit Talkers and very much I appreciate this contribution to the study of First Nations spirituality and healing. I found the book to be a valuable compilation of accounts of ceremonies and important insights as to how they work. As a First Nations scholar at the First Nations University of Canada, I work with many elders who have been talking about the need to research, write and teach more openly about spirituality. They strongly emphasize the notion of the reality of spirit, and that our true nature is that we are spirit beings. They feel that in this current time it is urgent that scholars assist in bringing their spiritual knowledge into the classroom. In my efforts to further understand the reality of spirit I have become interested in the work on reincarnation that Dr. Ian Stevenson pioneered at the University of Virginia. Many of his earliest cases were on First Nations, and Dr. Antonia Mills, whom I know, has carried on his work. At the University of Virginia, I also met Dr. Bruce Greyson who is one of the leading researchers on near death experiences. The reason I mention this is because of their empirical research which strongly supports the notion that there is something to consciousness at a spirit level. I have personally had unexplainable experiences in ceremonies and so have no difficulty accepting the idea that there is some form of higher intelligence at work. Your book has clarified a lot of things about how ceremonies work and ceremonialists operate. I plan to introduce your book into my class on First Nations spirituality. Dr. Lyon has created a very profound and very readable book about the abilities of Native American medicine men and women, often referred to as shamans. He writes from his first-hand knowledge from 40 years of researching Native American medicine men and women. But he goes beyond that to include and often quote verbatim from the written accounts of others who have observed the various medicine powers and ceremonies over nearly 350 years. For example, the first person to have written about the shaking tent ceremony was Samuel de Champlain, in the 1600s. Lake Champlain, that separates New York and Vermont, was named after him. This is major scholarship. It is an astounding bit of personal and documented research, covering the powers and abilities of Native American shamans. I believe it will be the standard for all future work on Native American spiritual culture. Perhaps the extent of the material will make clear that medicine men and women were not simply magicians, but rather controlled and used strong powers to further their own and their tribes’ welfare – powers still not available to most people in our Western culture. The inability of European settlers to believe in the existence of such abilities – literally magic – caused them to see the few events they did observe to be simple tricks. That was the only explanation their minds could accept. For this and other reasons, few white settlers were allowed to observe the full extent of the ceremonies and the results. Native Americans had no interest in trying to educate the settlers because the latter appeared stupid for not believing what they saw with their own eyes. That this false mind set still influences us is made apparent in the difficulty Dr. Lyon had in finding a publisher. In one instance a publisher had accepted it, but their Faculty Review Committee considered it too controversial! Truth is not always popular. Perhaps a major aid to help people understand the reality of the powers and ceremonies of Native American medicine men and women is in the way Dr. Lyon brings in the concepts developed in quantum physics. Quantum physics states, and proves, that our physical reality continually manifests from a series of underlying possibilities. Shamans can change reality by focusing, through ceremony and prayer, on an alternate possibility. Their success in selecting that possibility depends on the emotional intensity and duration of the focus on a particular outcome. Hence, the Native American’s need for intense and fairly long focused ceremonies to extract the desired possibility out of the many. For example, that the sun will shine for a three-day Sun Dance ceremony despite the early clouds and rain, as predicted in the weather forecast. An example from today is how a person with intense focus can affect the outcome of a computer being used as a random number generator. In repeated experiments it was found possible to alter the randomness by 1-2%. Imagine what a full bore, hours-long ceremony with dancing and drumming by hundreds might achieve! Scrap everything you thought you knew about Native American shaman/medicine men and women – and about reality – and READ THIS BOOK! I believe you will be fascinated. Life is to be enjoyed, not endured! Mr. Lyon has done a superb job in bringing a clearer understanding of the spirit world. His understanding of the medicine men (shamans) and their practice of spiritual healing is very well translated. This book gives a very real introduction to spiritual healing along with the facts and people involved along the way. This book takes you on a journey that will expand your conscious awareness of the existence of the spirit world, and the power it processes, thru time and evolution. I thoroughly enjoyed this book from cover to cover. I now have a better understanding of the Native American people and their quest and ways of life. I want to personally thank William Lyon for his life long dedication to this work. 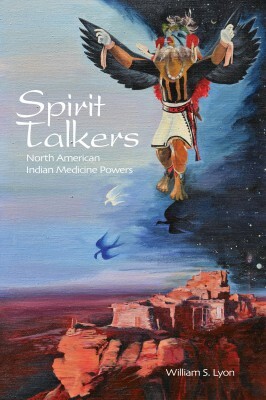 His book Spirit Talkers is the most comprehensive compiling of Native American Medicine that I’ve ever seen. I’ve know William for 20 years now and have observed his participation in many ceremonies conducted by my mentor and spiritual father Benjamin “Godfrey” Chipps. During my 23 years of being a Helper in Yuwipi ceremonies I’ve had the pleasure of being in ceremony with William numerous times. He has always shown his sincerity in desire to know and understand – and has been a keen observer of the “Medicine”. The book Spirit Talkers is not just an anthropological study from a person who has never experienced the medicine, it is written by someone who has first had experience. Thank you Bill. “medicine powers” — if only we can be open heart-soul-minded (kut-siur in the Sakha language). William Lyon’s Spirit Talkers is a breakthrough. He has systematically analyzed the psychology behind modern anthropology, and its often biased depictions of Native American medicine powers. Quantum Mechanics is a key to this new, more well-informed understanding of these powers. Western “civilization” had to wait until now to understand what North American Indians have always known – that perception changes matter, and that what we, as Westerners understand to be the truth, is less knowable than we think. Lyon’s book is an essential guide into this terrain of Space. This much awaited new book from Bill Lyon fulfills expectations and then some. Spirit Talkers is for those who (like this writer), badly needed a new direction away from the dreary and wholly uninspired dogma of established religion. I would hope that this fresh perspective on long suppressed topics would make the conventional take note, squarely taking on topics long shunted off into the dim, forgotten catacombs of the establishment. Dr. Lyon is perhaps the first to apply the conclusions of contemporary quantum physics, as set forth by Evan Walker in The Physics of Consciousness, to phenomena observed in Native American cultures over several centuries. The cumulative weight of so many anecdotes should be enough, as seen through the lens of contemporary science so advanced that physicists themselves are unsure what to make of it, to leave all but the most rigidly obstinate skeptics with a more receptive attitude to the real nature of cultures preceding our own. While it sometimes brings up questions, this contrasts with our major religious institutions, which come off resembling the droll spectators in accounts of events like the Three Prophecies of Fatima, who tried desperately to make the inconvenient go away by discrediting or otherwise minimizing the extraordinary. I guess it all comes down to what I and many of my generation knew instinctively from about the age of 18. While there are always individual exceptions, established religion has decayed into little more than institutionalized fraud, operating through ego and fear. There is a tendency especially among Americans who discover Native American culture to idealize. But while Indian societies may not in some ways have been any “better” than us with our holocausts, inquisitions, gulags and jihads, this reminds us sometimes of just how far we have drifted away from any direct uncomplicated relationship with life. The overwhelming consensus attitude of the West towards native cultures in the New World has always been of the “nasty, brutish and short” school. The West should think again. It’s too bad that he bases spirituality on Evan Walker’s The Physics of Consciousness. If we accept that consciousness survives physical death, then it follows that it can’t be based on the brain, nor can it be based on quantum mechanics or any other model of the physical world. The spiritual feats of shamans can only be understood from the viewpoint of the spiritual world, not from our physical world, and certainly not from the equations of quantum mechanics. Accepting the fact that consciousness survives death in no way negates the understanding that the feats of shamans are related to the understandings of quantum mechanics. The fact remains that consciousness and matter are interrelated, whether it be the consciousness of a spirit or the consciousness of a living person both can alter the nature of our physical reality. Furthermore, my explanation for the “spiritual feats” of shamans most definitely includes the viewpoint of the spiritual world, known as spirit rules by shamans. In addition, I do not base my understanding on “the equations of quantum mechanics” given physicists have yet to come up with any equation that explains this proven relationship between consciousness and matter. Rather it is based on the fact that our physical world arises from the level of quantum mechanics and that consciousness can alter quantum mechanics processes such that it, in turn, alters physical reality. Your comment implies that quantum mechanics is a “model of the physical world,” which it is not. It is a totally different system of operation that does not follow the rules of the physical world. Finally, you should not be equating “spirituality” with “spiritual feats” as they are two entirely different matters. PS: Since I find no sales record under your name, I’m assuming you have yet to read my book. If you had read it you would know that I did not simply use Walker’s book, rather I worked directly with Walker in crafting Chapter 1 of Spirit Talkers. You really should not be making befuddled comments on a book you have not even read. Bill, quantum mechanics is a model of the physical world, just as is general relativity and newtonian mechanics. The physical world seems to follow the rules of quantum mechanics to many decimal places. These are all attempts to explain the patterns we see in physical reality. I agree that consciousness can alter quantum mechanical processes, as shown by experiments performed by Dean Radin. What I was trying to say was that spiritual feats by shamans come from the spirit world, not from the physical world, and the spirit world is the world of consciousness. Spirituality is a quality of the spirit world – here we’re using words that need to be defined better. You are right, I have not yet read the whole book, but I did look at the introductory chapters of the book, and that is what my comments were based on. Also, shamans perform physical as well as spiritual feats. The removal of the bindings of a shaking-tent shaman is a spiritual feat. However, a power contest between two shamans to see who can be the first to remove a particular knot from a tree using only their power while standing ten yards away from the tree is a physical power feat. So shamans are adept at both forms of power feats. This is one of those rare books that leaves you sitting there sad because it ended, like a dear friend just moved out of town. My book is highlighted, tagged, and filled with notations of thoughts & insights. I love the bold descriptions of fluid reality as we are caught up in a wild world of magic and then reminded that all of this is possible in the realm of quantum physics – but it still leaves us amazed. The depictions of traditional Indian life being filled with laughter and a child-like innocence that allows the pure heart to live a life completely filled with Spirit leaves us utterly yearning to experience this state of being. I am now compelled to focus my heart-consciousness on this state. It is pointed out in detail how anthropology books are and have been written in the past, through deep misunderstandings and outright incorrect information. Having read some of these other books I was often left with a sense that something wasn’t right, that the author didn’t understand the context behind their perceptions. Bill Lyon’s information is exceptional, and he should be honored to be called Hohu sha. I strongly appreciated the Healer attitudes of Frank Fools Crow, and the passionate respect for Indian medicine in general. This is important material for those who study and practice healing work. I enjoyed reading Spirit Talkers. As soon as I finished, I started reading it again. I shared the book with Mikko, the leader of our Native American study group, it will be a topic of discussion among our group – Hawk’s Nest. It is a great read and adds to the belief that medicine powers are real. I am also inspired to read several books suggested by Bill Lyon in his introduction and bibliography. Wonderful information. Thank you for our spiritual growth. Hello Dear Bill. You are a wonder and we are grateful to know you and to have prayed, laughed and learned with you. You continue to be a blessing to our lives and to the lives of our ancestors and those great, great grandchildren still to come. We are so aware of the power of which you speak. We are thankful to the holy people who continue to practice the ancient faithful path of seeing” beyond” and knowing “the beyond”. They are not “tricked” by the material world. But how our medicine people love to be “the tricksters” to those human beings caught in the world of material illusion. Thanks to you for being true to your vision all these many years. The author’s love and deep connection to the Indian Shamanistic ways are intelligent, dignified and honest and well put into words, as these 2 chapters show. I am someone who has greatly benefitted from the powers of a Lakota medicine man some 25 years ago. It was a life-changing, entirely positive experience, and I can attest to Mr. Lyon’s view of those unexplainable mystical experiences. I still wonder what Godfrey meant when he said with an expression of pain on his face: “Difficult times are coming our way. The Spirits showed me”, without going into detail. That was 1987, and I had no idea what he possibly could mean – looking around these days i get an inkling.